Champs-Elysees 1996, not to be confused with the classic Parfum des Champs-Elysees from 1904, is one of Guerlain’s more controversial moderns. There are people who love it and people who loathe it. I can’t help but think that those who loathe it, hate it because they expected 1904’s Champs-Elysees to make a comeback and instead got something completely different. In Bottle: Sharp, sweet mimosa. Faintly powdery with a white floral background. I don’t mean background as in base note. I mean background as in, imagine this fragrance is a stage. The actors are the sweet mimosa. The background is this thick, lush wall of white florals. That is Champs-Elysees, clean, sweet, sharp, powdery and utterly, unapologetically floral. Applied: Mimosa is a major player but it’s battling it out for that lush curtain of florals. I get a bit more almond on application than off. Champs-Elysees reminds me of soap. It’s clean and bright and sweet like a lush bar of luxury soap and a bathtub filled with flowers floating on the surface. This is a white, light, delicate wall of florals fifty feet high. There is little change on dry down for me. The one thing I noticed was an increase in that powdery feel. Extra: Word on the street has it that Champs-Elysees 1904’s notes may have looked something like this: Bergamot, violet, rose, iris, leather, oakmoss, benzoin, wood. And knowing Guerlain, it was probably laid over that iconic base. I can almost smell it in my mind but that is a pretty silly notion. The original was bottled in a beautiful turtle-like design. It’s really too bad the 1904 version and its re-issue is super rare and also super expensive (almost $14,000!). I want to have a sniff. Design: Champs-Elysees 1996 is bottled in a pleasing, rather geometric bottle. What takes away from it most is the square wedge at the base of the bottle used to keep it standing. Otherwise, it is an interesting shape and would have been better had its physics allowed it to stand without that jerry-rigged bit at the bottom. Nevertheless, the bottle is easy to hold. The cap is plastic. The sprayer works just fine. Notes: Mimosa, almond blossom, rose, buddleia, hibiscus, almond wood. Poor Champs-Elysees 1996. I feel bad for it. It’s truly a very nice, modern, powdery white floral with sweet notes making it ultra-feminine. I wish more people liked it but I certainly understand the frustration. I do wonder if Champs-Elysees went by any other name it would catch less flack. It wouldn’t please those who currently dislike it but at least it wouldn’t disappoint in addition to being displeasing. 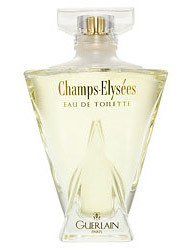 Reviewed in This Post: Champs-Elysees, 2009, Eau de Toilette. This entry was posted in floral, fresh, guerlain, Reviews By House and tagged bottle, champs, elysees, floral, fragrance, guerlain, review, sweet. Bookmark the permalink. This is a lovely, feminine fragrance. It reminds me of the perfume my mother wore when I was a child, but yet it has a modern overall cast. This is the fragrance I save for my special occasions!